Primrose Court is a sheltered accommodation development on the junction between Goring Road and Clays Hill in Steyning. Built in 1985, it comprises 29 one and two bedroom flats. “Situated on the outskirts of town, with lovely back gardens, an orchard beyond and views of the Downs”. There is no public access to this site, but we are planning some work days and other events in future, when we will be able to show off the Orchard. The lower part of the gardens of Primrose Court border onto Clay’s (or Fever) Field, and are an overgrown former orchard. We believe the orchard was originally planted in the 1940s by Dr Wheeler-Bennet who owned the house before the local well known doctor, Dr Dingemans bought it in 1955. When Primrose Court was built on the site of the original house in the late 1980’s, the large garden was left mostly untouched. Unfortunately over the last 40 years, the orchard had become overgrown and has mostly disappeared with just 3 of the old apple trees remaining. We met with a group of 15 residents and the onsite Development Manager of Primrose Court in 2015. 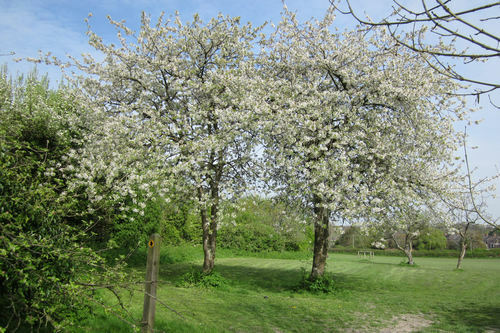 They are very keen to rejuvenate this old orchard, and have asked us to manage this project for them. We were delighted to obtain a grant from the People’s Trust for Endangered Species Orchard Project to allow us to buy 8 new fruit trees for this Orchard. The residents chose apples, (Including 2 Sussex apples) pears, and plums to add to the 3 remaining apples in their orchard. These were planted at the end of February 2016. 4 more trees were added in February 2017. In addition to the 3 existing apple trees remaining from the old Orchard area, we have planted the following. A well known variety, originated at Petworth Park in Sussex. This is a far better apple than many supermarket bought examples, because if it is left on the tree until it is properly ripe, it has a lovely sweet crunchy nutty, almost smoky flavour. An old Sussex apple sent to the National Fruit Trials in 1937 by Mr Fred Streeter, head gardener at Petworth House in West Sussex. Middle to late in season, it is a large, tall and often conical apple with pronounced ribs. The body is pale green/yellow, flushed with orange, scarlet and carmine stripes, with russet dots. The flesh is crisp, white, with a good blend of sweetness and sharpness. Dual purpose, but perhaps more cooker than dessert. It keeps to December. Still a rare apple. One of the oldest apple varieties, reputedly brought to England with the Romans. It is also known as the wise apple, as it flowers after the last frosts. It is a rich fruity, pineapply late eater. A rare apple. Also known as the Isaac Newton apple, as it was reputedly the apple tree that he was sitting under near Grantham, Lincs, when the Theory of Gravity ‘hit’ him in 1665. This original tree died in 1816, but wood was successfully propagated from it and a new tree grown. Grafts were taken from this tree by the Malling Research Station in Kent, who supplied it to the nursery we obtained this tree from. It makes a lovely shaped tree and the fruits are large and cook well. We are not aware of another one in Steyning. A good cox-like eating apple developed in Kent in 1918. Found growing in Blenheim, Oxfordshire in 1740. Grown as a cooker, but also can be eaten when fully ripe when it has with a nutty flavour. A very popular sweet early dessert apple. Developed in Worcestershire in 1873. An English dessert pear not unlike Doyenne du Comice, with excellent flavour and good reliable cropping. The most well known and popular pear in the UK. A good reliable cropper. One of the most popular culinary plum varieties. Excellent colour and flavour. Also good to eat when fully ripe. It makes a great jam. An excellent self-fertile sweet yellow gage-like dessert plum.